One of the latest things happening at Magic tournaments, especially the new slew of Grand Prix events, is the attending artists producing playmat sketches for tourney prizes. The Magic card is included for scale! This wide mat also gives me a chance to try out the larger image window on the blog’s new format. Mmm, roomy. The mat’s about eighty to ninety percent done at this point. I’m sure it’ll be on show with the other artists’ mats during Saturday and possibly a portion of Sunday. Considering rkpost and Mark Tedin are attending, I think it’s fair to say there’ll be some damn nice looking mats to win. Don’t miss out. Don’t say you weren’t warned. CCG Artist proofs are special version of the cards that have a blank white back. Each artist receives roughly fifty of these for each card he has published. Usually they’re sold at shows as a collectible. Occasionally people pay extra to get a sketch put on the back. 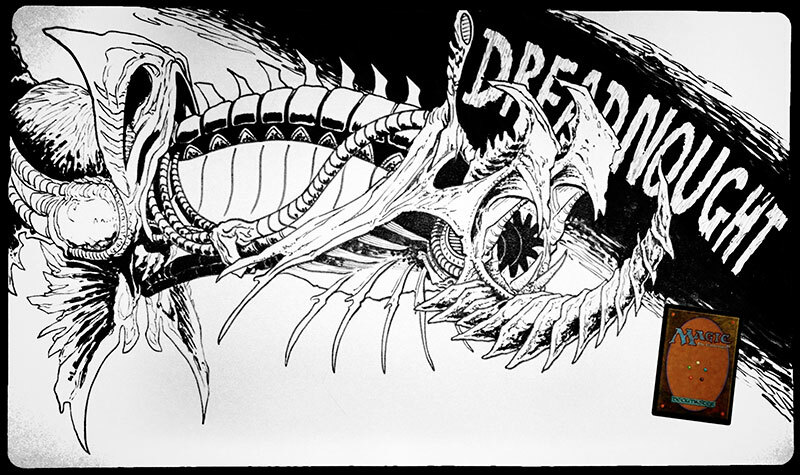 This was a special commission and the Phyrexian Dreadnought shown here stretches across four Dreadnought APs. The person who commissioned this was also going to buy the Dreadnought original but had to back out. His loss as there was someone else eagerly waiting to nab it.